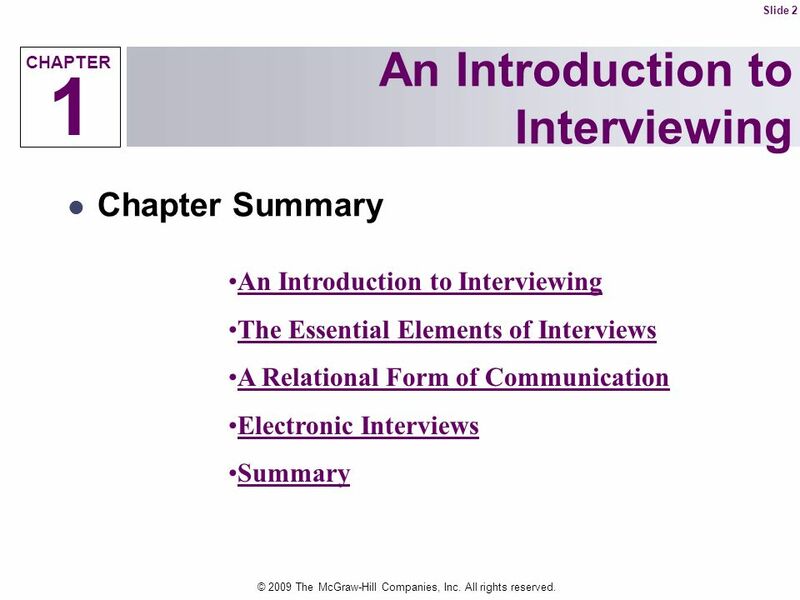 Slide 2 CHAPTER An Introduction to Interviewing 1 Chapter Summary An Introduction to Interviewing The Essential Elements of Interviews A Relational Form of Communication Electronic Interviews Summary © 2009 The McGraw-Hill Companies, Inc. All rights reserved. 3 © 2009 The McGraw-Hill Companies, Inc. All rights reserved. 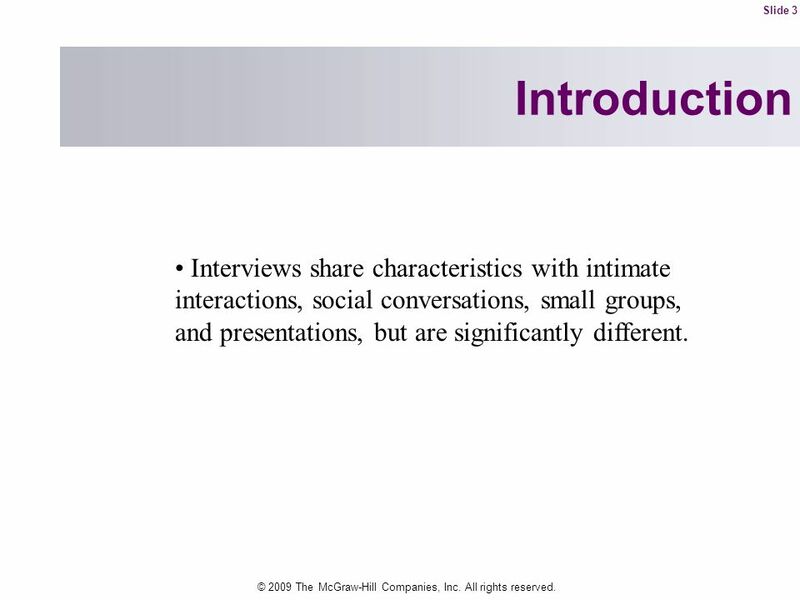 Slide 3 Introduction Interviews share characteristics with intimate interactions, social conversations, small groups, and presentations, but are significantly different. © 2009 The McGraw-Hill Companies, Inc. All rights reserved. 4 © 2009 The McGraw-Hill Companies, Inc. All rights reserved. 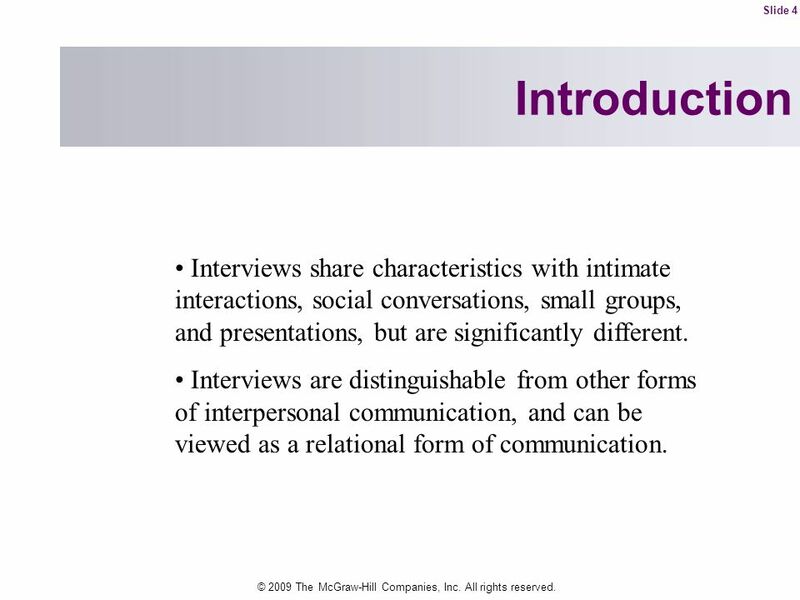 Slide 4 Introduction Interviews share characteristics with intimate interactions, social conversations, small groups, and presentations, but are significantly different. Interviews are distinguishable from other forms of interpersonal communication, and can be viewed as a relational form of communication. © 2009 The McGraw-Hill Companies, Inc. All rights reserved. 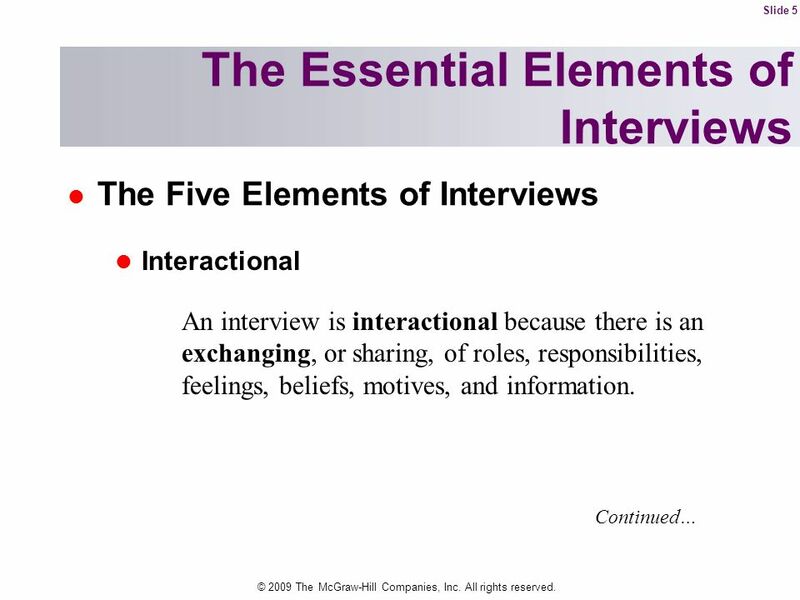 Slide 5 The Essential Elements of Interviews The Five Elements of Interviews Interactional An interview is interactional because there is an exchanging, or sharing, of roles, responsibilities, feelings, beliefs, motives, and information. Continued… © 2009 The McGraw-Hill Companies, Inc. All rights reserved. 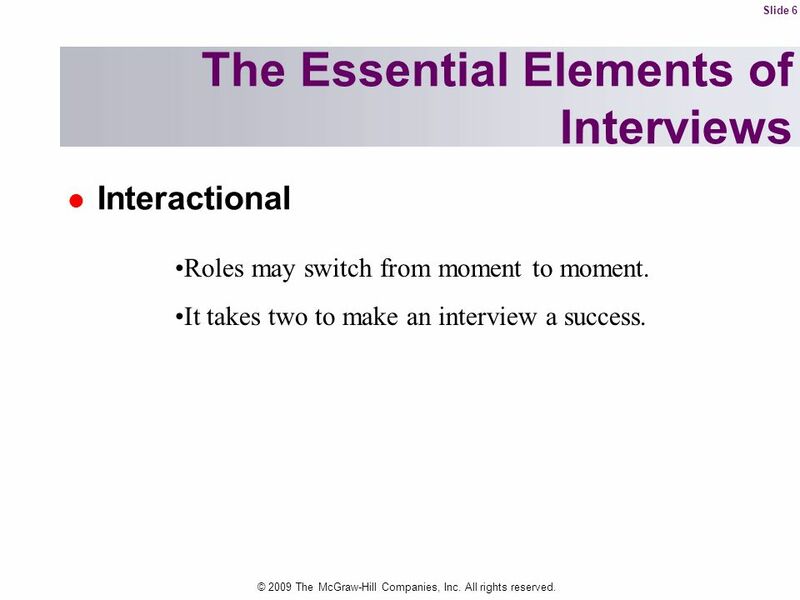 Slide 6 The Essential Elements of Interviews Interactional Roles may switch from moment to moment. It takes two to make an interview a success. © 2009 The McGraw-Hill Companies, Inc. All rights reserved. 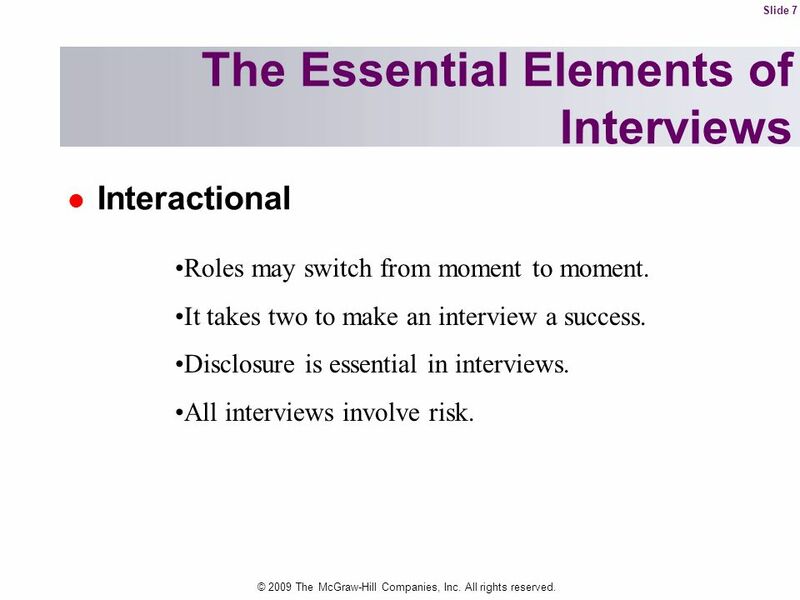 Slide 7 The Essential Elements of Interviews Interactional Roles may switch from moment to moment. It takes two to make an interview a success. Disclosure is essential in interviews. All interviews involve risk. © 2009 The McGraw-Hill Companies, Inc. All rights reserved. 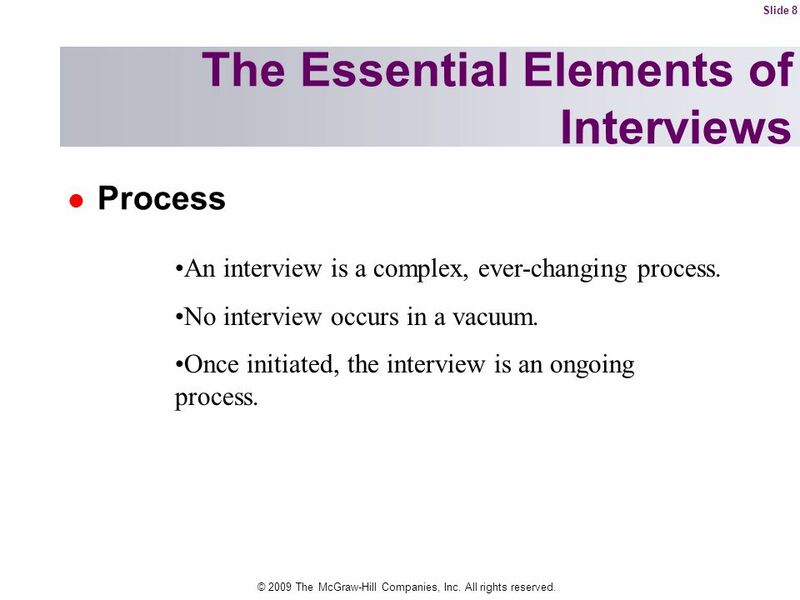 Slide 8 The Essential Elements of Interviews Process An interview is a complex, ever-changing process. No interview occurs in a vacuum. Once initiated, the interview is an ongoing process. © 2009 The McGraw-Hill Companies, Inc. All rights reserved. 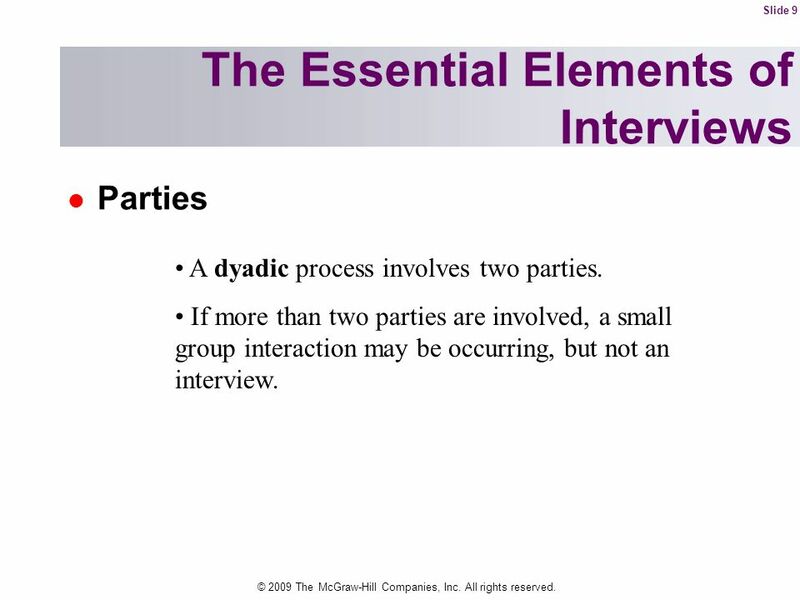 Slide 9 The Essential Elements of Interviews Parties A dyadic process involves two parties. If more than two parties are involved, a small group interaction may be occurring, but not an interview. © 2009 The McGraw-Hill Companies, Inc. All rights reserved. 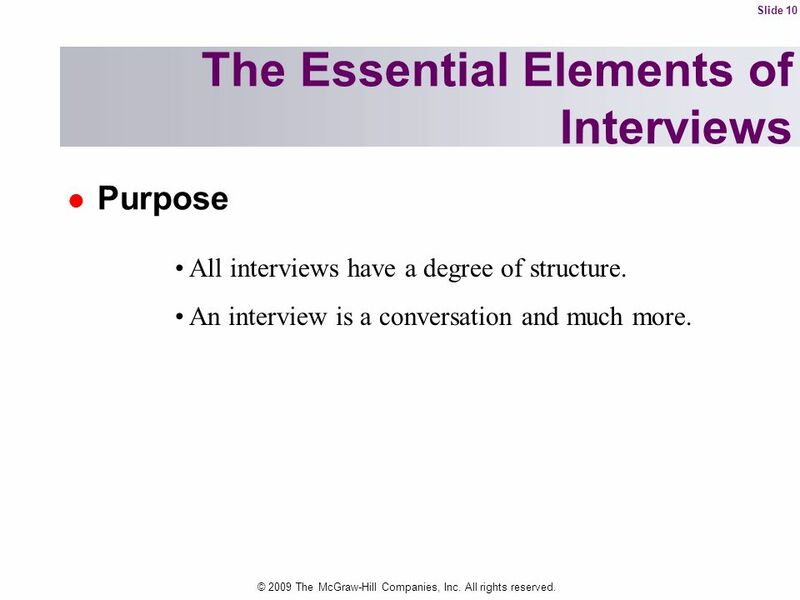 Slide 10 The Essential Elements of Interviews Purpose All interviews have a degree of structure. An interview is a conversation and much more. © 2009 The McGraw-Hill Companies, Inc. All rights reserved. 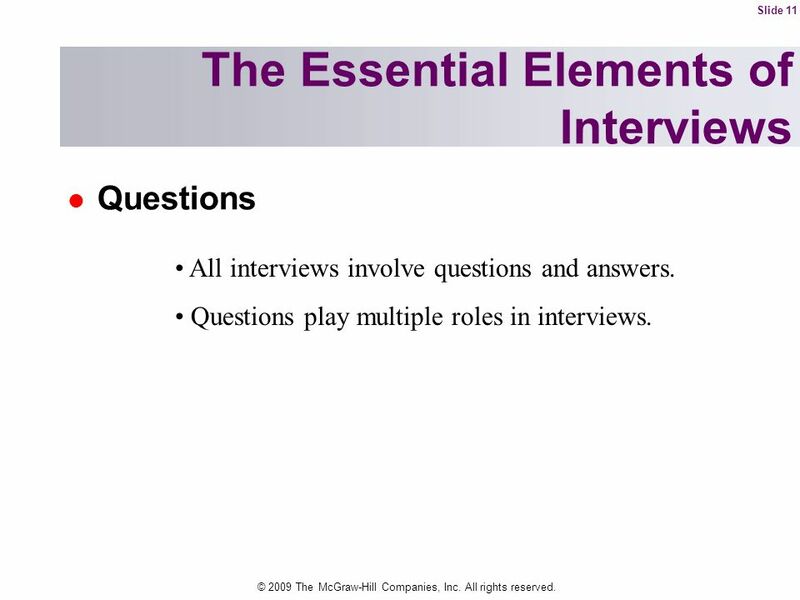 Slide 11 The Essential Elements of Interviews Questions All interviews involve questions and answers. Questions play multiple roles in interviews. © 2009 The McGraw-Hill Companies, Inc. All rights reserved. 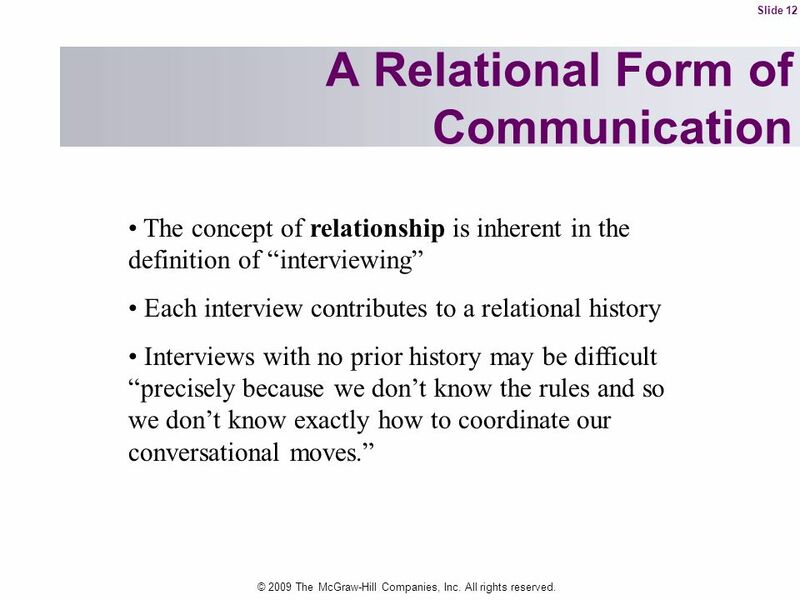 Slide 12 A Relational Form of Communication The concept of relationship is inherent in the definition of “interviewing” Each interview contributes to a relational history Interviews with no prior history may be difficult “precisely because we don’t know the rules and so we don’t know exactly how to coordinate our conversational moves.” © 2009 The McGraw-Hill Companies, Inc. All rights reserved. 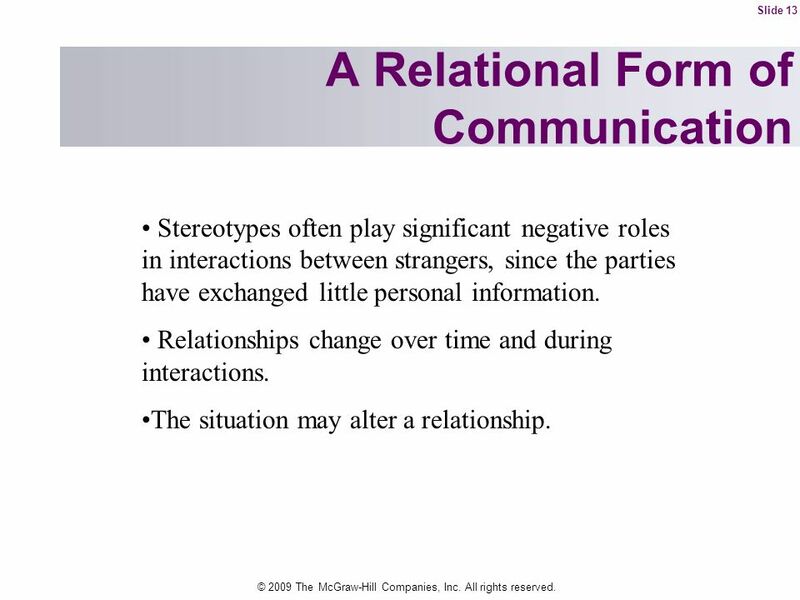 Slide 13 A Relational Form of Communication Stereotypes often play significant negative roles in interactions between strangers, since the parties have exchanged little personal information. Relationships change over time and during interactions. The situation may alter a relationship. © 2009 The McGraw-Hill Companies, Inc. All rights reserved. 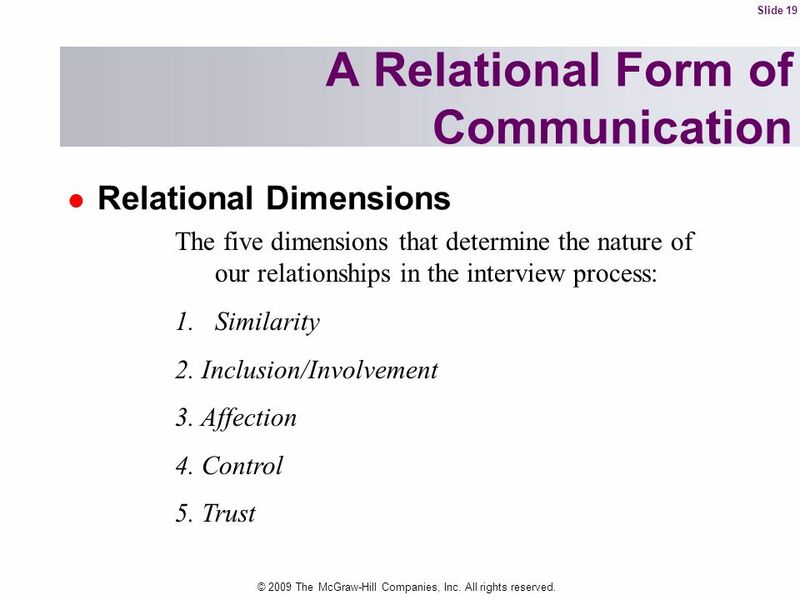 Slide 14 A Relational Form of Communication Relational Dimensions The five dimensions that determine the nature of our relationships in the interview process: © 2009 The McGraw-Hill Companies, Inc. All rights reserved. Slide 15 A Relational Form of Communication Relational Dimensions The five dimensions that determine the nature of our relationships in the interview process: Similarity © 2009 The McGraw-Hill Companies, Inc. All rights reserved. Slide 16 A Relational Form of Communication Relational Dimensions The five dimensions that determine the nature of our relationships in the interview process: Similarity 2. Inclusion/Involvement © 2009 The McGraw-Hill Companies, Inc. All rights reserved. Slide 17 A Relational Form of Communication Relational Dimensions The five dimensions that determine the nature of our relationships in the interview process: Similarity 2. Inclusion/Involvement 3. Affection © 2009 The McGraw-Hill Companies, Inc. All rights reserved. 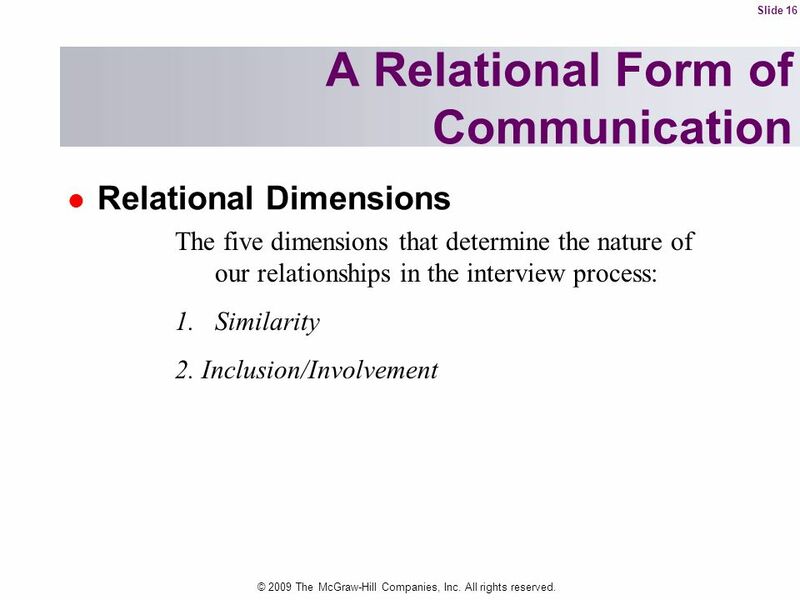 Slide 18 A Relational Form of Communication Relational Dimensions The five dimensions that determine the nature of our relationships in the interview process: Similarity 2. Inclusion/Involvement 3. Affection 4. Control © 2009 The McGraw-Hill Companies, Inc. All rights reserved. 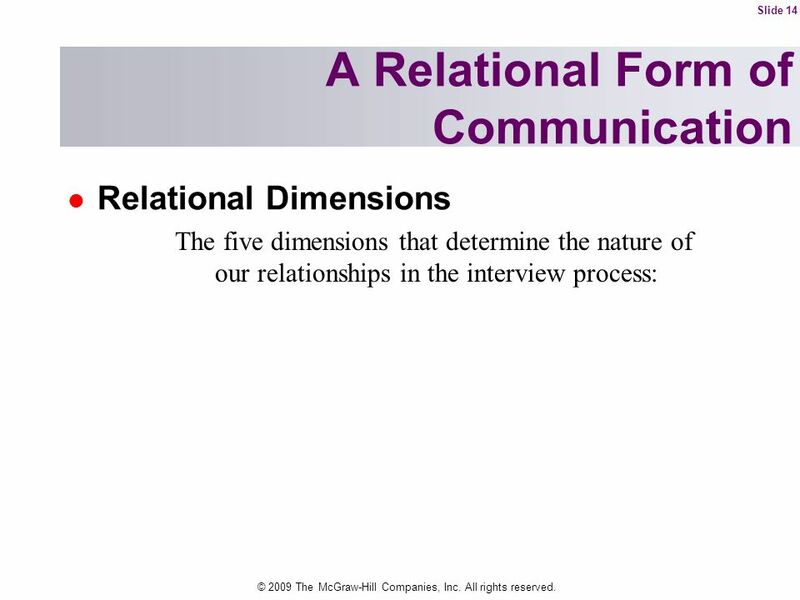 Slide 19 A Relational Form of Communication Relational Dimensions The five dimensions that determine the nature of our relationships in the interview process: Similarity 2. Inclusion/Involvement 3. Affection 4. Control 5. Trust © 2009 The McGraw-Hill Companies, Inc. All rights reserved. 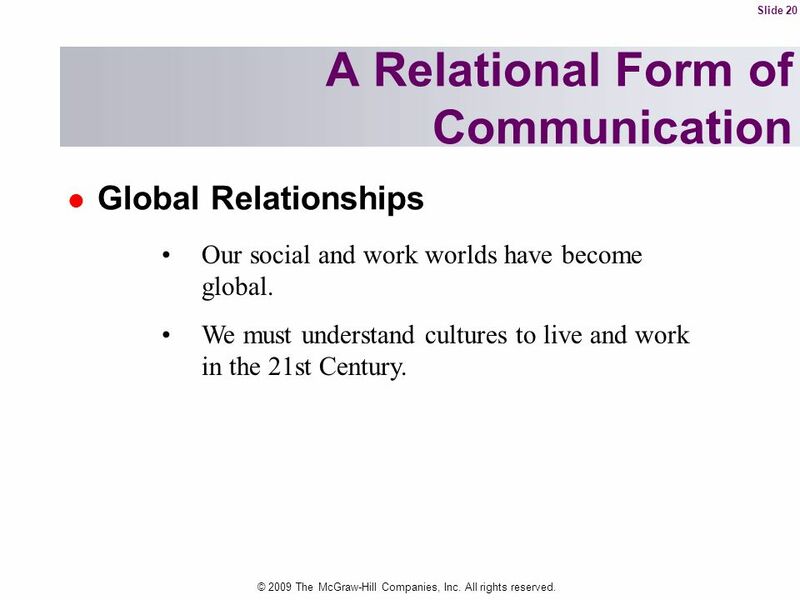 Slide 20 A Relational Form of Communication Global Relationships Our social and work worlds have become global. We must understand cultures to live and work in the 21st Century. © 2009 The McGraw-Hill Companies, Inc. All rights reserved. 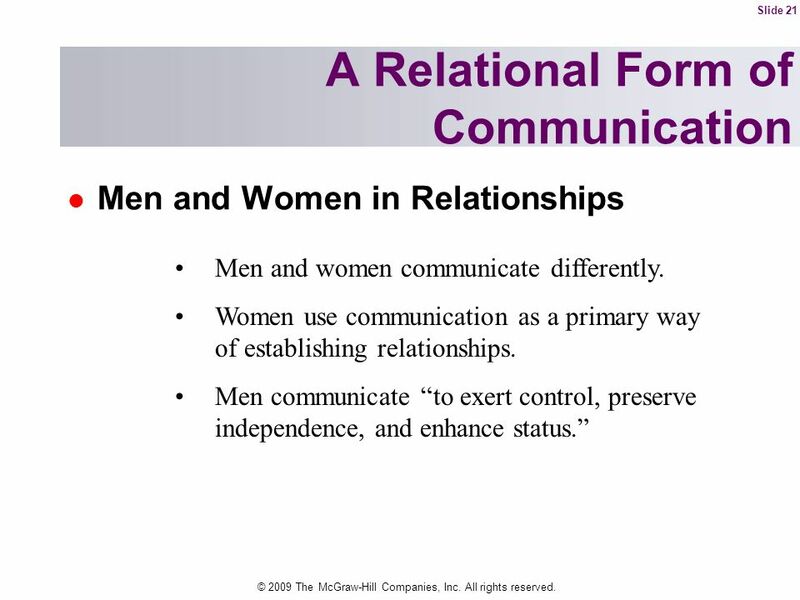 Slide 21 A Relational Form of Communication Men and Women in Relationships Men and women communicate differently. Women use communication as a primary way of establishing relationships. Men communicate “to exert control, preserve independence, and enhance status.” © 2009 The McGraw-Hill Companies, Inc. All rights reserved. 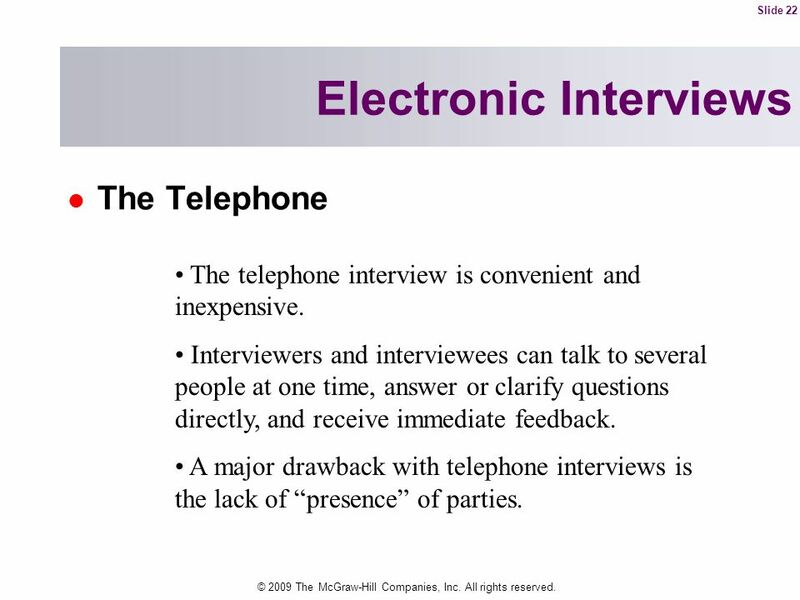 Slide 22 Electronic Interviews The Telephone The telephone interview is convenient and inexpensive. Interviewers and interviewees can talk to several people at one time, answer or clarify questions directly, and receive immediate feedback. A major drawback with telephone interviews is the lack of “presence” of parties. © 2009 The McGraw-Hill Companies, Inc. All rights reserved. 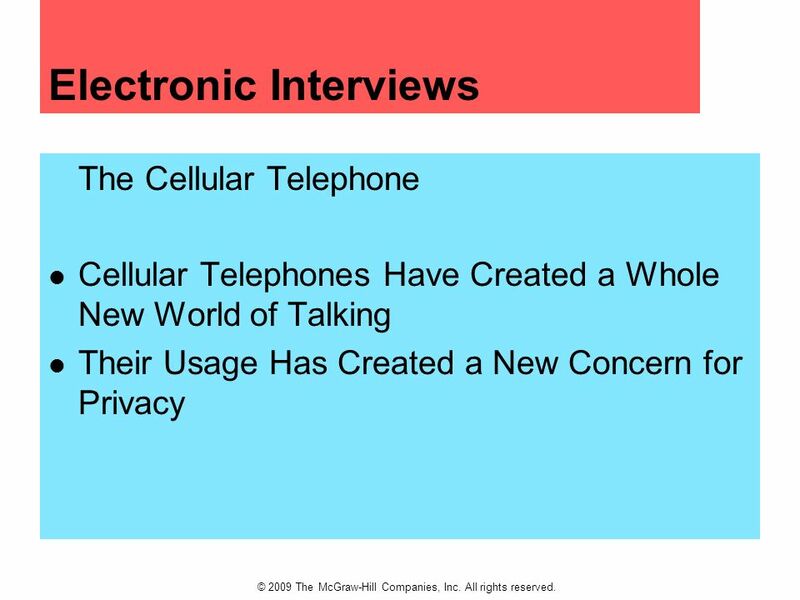 The Cellular Telephone Cellular Telephones Have Created a Whole New World of Talking Their Usage Has Created a New Concern for Privacy © 2009 The McGraw-Hill Companies, Inc. All rights reserved. 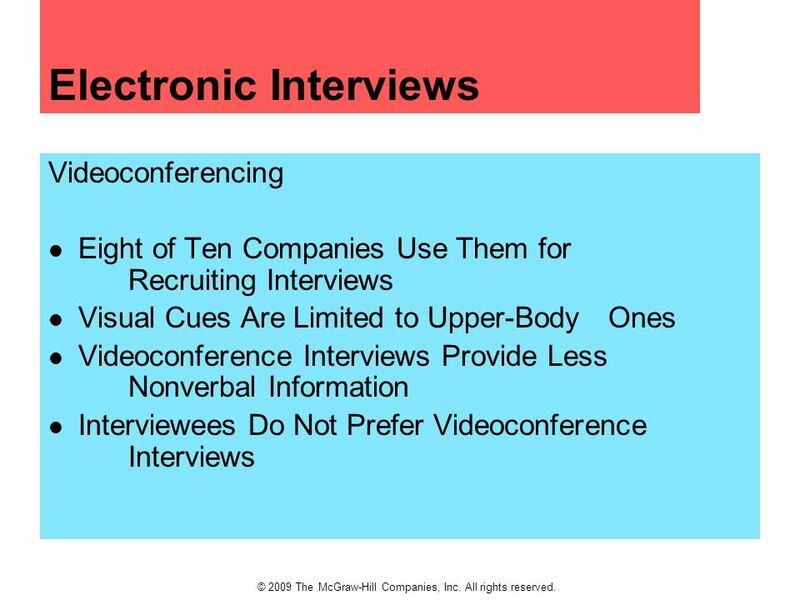 Videoconferencing Eight of Ten Companies Use Them for Recruiting Interviews Visual Cues Are Limited to Upper-Body Ones Videoconference Interviews Provide Less Nonverbal Information Interviewees Do Not Prefer Videoconference Interviews © 2009 The McGraw-Hill Companies, Inc. All rights reserved. 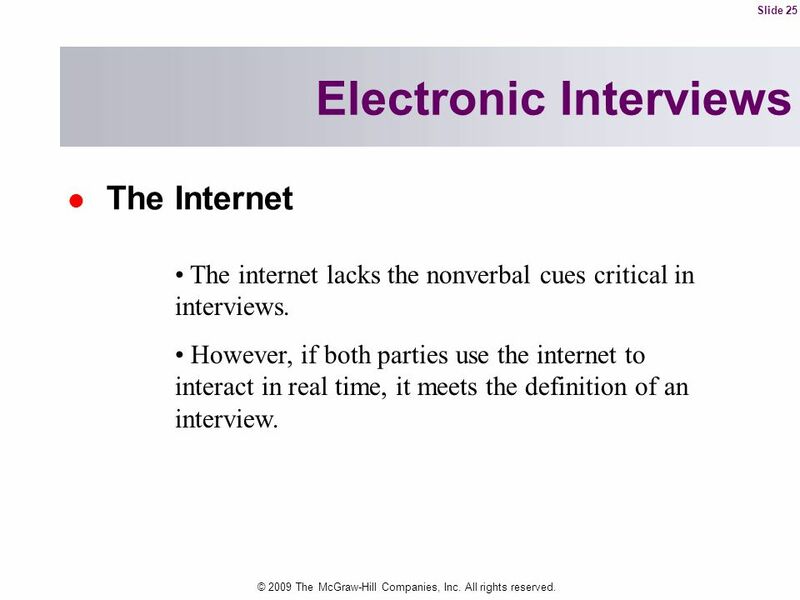 Slide 25 Electronic Interviews The Internet The internet lacks the nonverbal cues critical in interviews. However, if both parties use the internet to interact in real time, it meets the definition of an interview. © 2009 The McGraw-Hill Companies, Inc. All rights reserved. 26 © 2009 The McGraw-Hill Companies, Inc. All rights reserved. 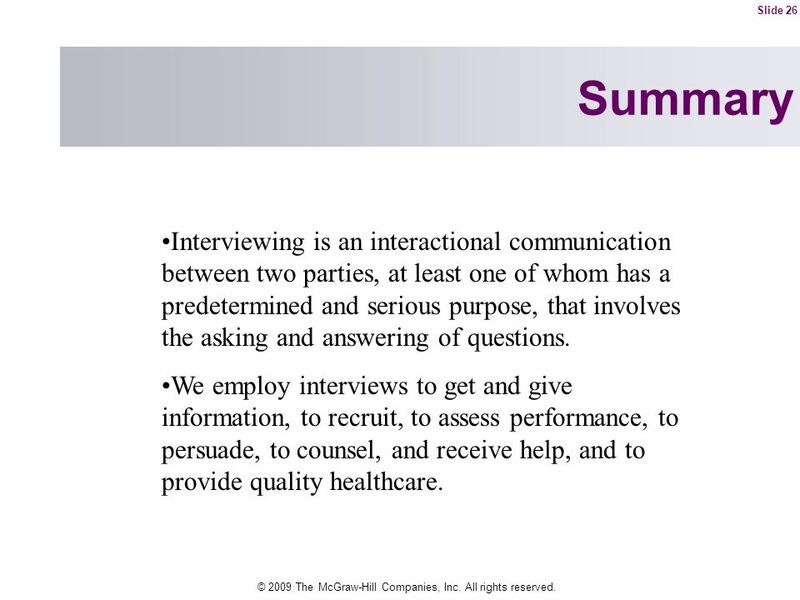 Slide 26 Summary Interviewing is an interactional communication between two parties, at least one of whom has a predetermined and serious purpose, that involves the asking and answering of questions. We employ interviews to get and give information, to recruit, to assess performance, to persuade, to counsel, and receive help, and to provide quality healthcare. © 2009 The McGraw-Hill Companies, Inc. All rights reserved. 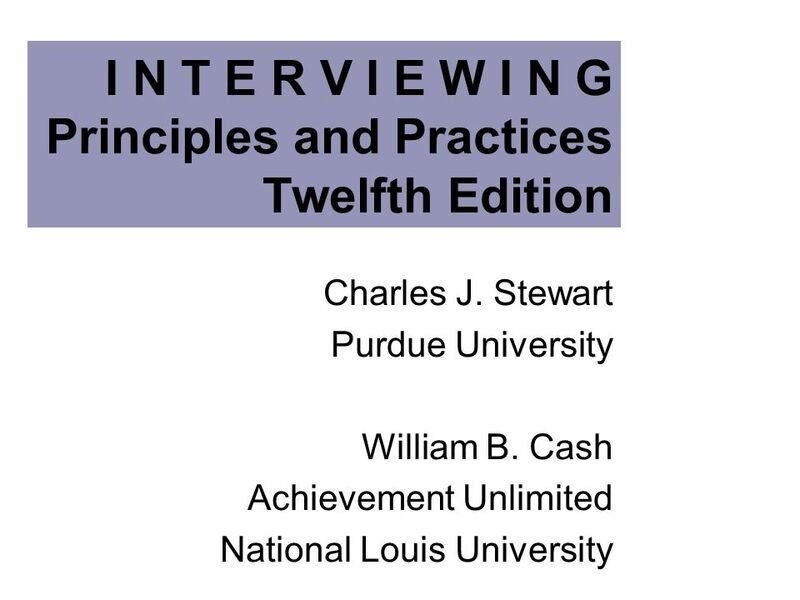 Download ppt "I N T E R V I E W I N G Principles and Practices Twelfth Edition"
CHAPTER 12 MOTIVATION © 2003 McGraw-Hill Australia Pty Ltd. PowerPoint Slides t/a Management: A Pacific Rim Focus Enhanced Edition. Slides prepared by.